Since I have lots of time today, I thought I'd make another brayered card. Creating them takes time ... figuring out what colors to use and what order to add the colors, etc. The actual brayering itself is pretty fast. I found a few websites that have beautiful landscape photos and they have been a source of inspiration for my brayered cards. Take the Tropical Sunset card from April 14th ... I saw a photo that had a large palm with a wharf in the background and was able to use that idea in my card. Today I working from a photo of a lake with mountains in the distance and cattails (bulrushes) in the foreground. I'm pretty happy with how it turned out. Hope you like. 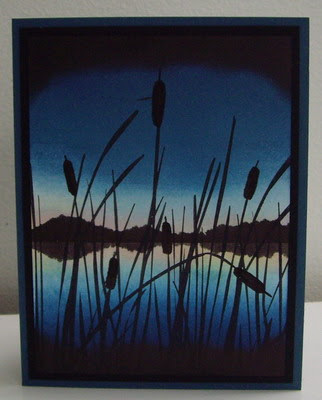 "Night Sky at the Lake"
On the Whisper White cardstock, I brayered with Baja Breeze 1/3 up from the bottom of the page and 1/2 way down from the top. Next I brayered Not Quite Navy on top of both ends of the cardstock, making sure to not completely cover the Baja Breeze (leave just a little showing). Final brayering was Night of Navy on top of both ends of the cardstock, making sure to not completely cover the Not Quite Navy. There will be a small amount of white space just below center of the cardstock. Using a small sponge, I added Pretty in Pink in that white space, not completely covering all the white. I sponged Barely Banana on top of the Pretty in Pink, making sure all the white space is now covered. I added a post-it note across the middle of this lighter space to mark the horizon line. Next, I ripped a mask from scrap paper for a low range of mountains. I placed it above the masked horizon line and used a sponge and Basic Black ink, to sponge in the mountain range until it was very dark. I used my heat tool to heat set the image and dry the ink. I also heat set the ripped mountain range mask .... the mask needs to be dry. I removed the horizon line mask and flipped the mountain range mask upside-down to mask the reflection of the mountains in the water below the horizon line. I sponged the reflection with Basic Black ink, but not too dark. I inked the grass stamp from the Inspired by Nature set with Basic Black ink and stamped at the bottom of the card. I punched a slot in the acetate to create a stencil for the cattails (you can use scrap cardstock instead of acetate, but the acetate allows you to see where you'll be placing your "stencil"). Using the stencil, sponge and Basic Black ink, I randomly sponged in five cattails. Using the Basic Black Stampin' Write marker, I made some of the cattails larger and also added a small thin stem that protrudes from the top of each one. I heat set the image. I sponged Basic Black ink along the bottom and top of the cardstock and heat set again. I mounted the brayered image on Basic Black cardstock and then mounted the framed image onto the card base of Not Quite Navy cardstock.